(posted December 2, 2010) — The deadline for applications was December 1. We thank everyone who applied! The judging panel will begin work immediately, and hope to complete their work by mid-December, with notifications going out thereafter. 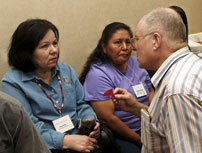 Encouraging Native involvement in the GWS biennial conferences. The George Wright Society, in partnership with several funders, offers travel grants to support the participation of Native people at the Society's biennial conferences — the leading professional meeting on parks, protected areas, and cultural sites. 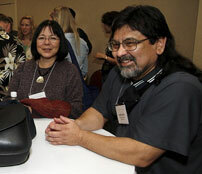 To date, the NPTG program has enabled nearly 30 Native people to attend the 2007 and 2009 conferences. We are hoping to expand the scope of the program for the 2011 conference. WHY ARE THESE GRANTS BEING OFFERED? The interface between Native interests and parks, protected areas, and cultural sites is a realm of great ferment, both in terms of policy and philosophy. To have genuine and critically enriching dialogue, there must be face-to-face engagement between Native and non-Native people. This dialogue can lead to multi-directional learning, improved relationships, new conservation strategies, and expanded vision and planning. The GWS hopes to facilitate this dialogue by offering these travel grants. WHO IS ELIGIBLE? Non-student indigenous people from Canada, Mexico, or the USA (including US Territories) who are involved in the protection, management, or study of land, its biological/cultural systems and features, or Native land rights. “Indigenous people” in this context includes people identifying as American Indians, Alaska Natives, indigenous Mexicans, First Nations, Métis, Native Hawaiians, Inuit, and Aboriginals. We regret that we do not have funds to support attendance from indigenous people outside of Canada, Mexico, and the USA. HOW ARE GRANT WINNERS SELECTED? An evaluation committee (the majority of whom are Native people) will award the grants based on a review of applications. Preference may be given to individuals who have submitted abstracts to give presentations at the conference. Financial need and geographical/cultural representation will also be considered. WHEN ARE GRANTS ISSUED? Grants will be disbursed by check (in US dollars) at the conference. No advance payments can be made, and any currency exchange fees applied to the check by the recipient’s home bank will be the responsibility of the recipient. Grant recipients may be required to submit copies of their travel itinerary and receipts prior to the time of disbursement. HOW DO I APPLY? The deadline for applications has passed. 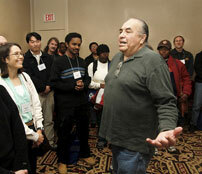 Thank you for your interest in the Native Participant Travel Grant Program.